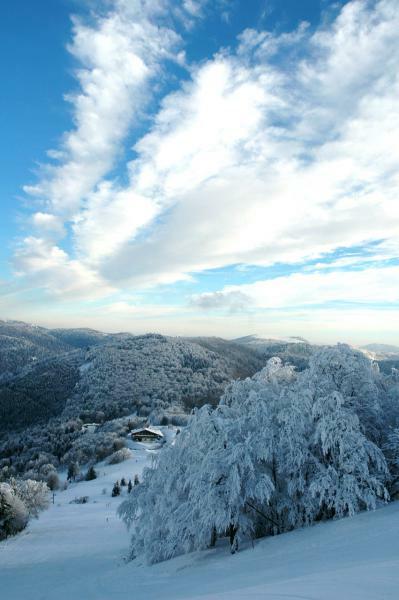 It is the only resort in Haute-Saône, this family resort at 1148 meters above sea-level, is situated at the heart of the Franche Comté peaks nature reserve. Three downhill or cross country circuits are on offer. The ski slopes at the "Planche-des-Belles-Filles" allow you to ski and have fun however good a skier you are. Six cross-country ski tracks offer about 50 km of marked circuits. The Scandinavian Pass also allows you to go as far as the Ballon d’Alsace via the Peaks Circuit (“Circuit des Crêtes”). Three ski tows take you to the five approved "slalom" tracks. * A ski-chair is proposed for people with reduced mobility. From 9.00a.m. to 5.00p.m., on Wednesdays, Fridays, Saturdays and Sundays (during term time), Every day during the school holidays. A plan of the tracks and the price lists are available on www.pdbf.fr or at the Tourist offices.